Do Your Children Surf Unprotected? As a business owner, I take advantage of how useful the internet is every day. As a Mom however, I also see the bad side of the internet: My kids definitely cannot use the internet unsupervised or without some type of monitoring. If you are a parent, you know exactly what I am talking about. Danger and inappropriate content lurk everywhere online. You can't leave it up to your kids to do the right thing and monitor their own internet use. This is where a company called SpectorSoft comes in. SpectorSoft develops markets and supports Internet Safety Software products for parents that would like to protect their kids from the dangers on the Internet. In this day of Facebook, MySpace, Twitter, and all of those cool sites that kids love to be a part of, a parent has to take an ACTIVE role in monitoring their activity online. Our childrens' innocence and often their very safety depend on it. Parents definitely need to install a monitoring software on any PC your child will be using to supervise and records your child’s PC and Internet activity. Spector Pro is a product that can do just this. Spector Pro also automatically records their chats, instant messages, emails, the web sites they visit, what they search for, what they do on MySpace and Facebook, the pictures they post and look at, the keystrokes they type, the programs they run and much more. It may sound invasive to your child, but in this day and age I would rather be invasive and protective, than sorry. You can learn more about SpectorSoft and Spector Pro at www.spectorsoft.com. As a work at home Mom and an owner of a resource site, I always love to find promising new resource sites. I know firsthand that ownership and operation of a Home Business is not easy. However, there is help out there. I manage this site in order to help those that are taking on this monumental task. There are lots of other great resource sites out there as well. One promising new site: Home Business Bug. Home Business Bug is a great site with lots of resources for those who Work at Home. There are great articles, lots of startup ideas, and some great advertising options for those who are already in business. HomeBusinessBug writes articles like "What is the difference between a licensee, distributorship, and a franchisee?" to help people understand basic home based business concepts. Do you have a home based business? Advertise with HomeBusinessBug for FREE. This is a great way to go for those who want to get their feet wet and advertise on the site. All in all, if you Work From Home, or are thinking of doing so, this site is definitely worth a look! When we first start our Direct Sales business, we have made a commitment to that company by writing the check and ordering the starter kit. While signing on the dotted line of the agreement is a commitment to that company, it is a commitment to you and your business? Have you committed to any of the following things lately? Why not take some time today and configure a commitment form for yourself and your business. Sign it and post it on your bulletin board. Seeing that each day you will know that you have cemented your career goal and revitalized your business. How inspiring can that be? Would love to make some new friends there. How about you? This is a GREAT way to stay focused and committed to your business. Draft your committment form to yourself today. Want the Skinny on Direct Sales? The first 5 participants win a complimentary book! ** To qualify for the free book you must go to Beth’s Blog and participate by offering comments on one or more of the topics**. Don’t forget to mention in your comment that you saw this opportunity on Direct Sales Moms in order to win a book. The Skinny on Direct Sales is an invaluable resource for direct sales professionals either embarking on their direct sales career or those who have already entered this exciting world and need a little insight or motivation. 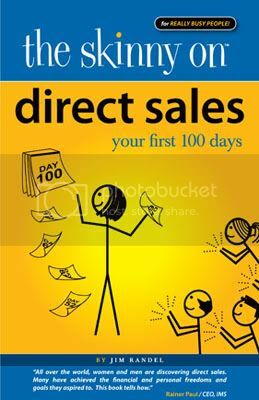 The Skinny on Direct Sales will help professionals create a 100 day plan of success. It outlines the pitfalls that other direct sales folks have overcome. It is a great motivator, advises on good selling skills and applying the guidelines will help develop a foundation for success. The book concludes with ten practical tips these professionals should follow to ensure a long and healthy career in direct sales. The Skinny on book series is quickly gaining popularity for its comprehensive analysis of topical subjects, told in an entertaining story format. Illustrated and easily read in 1 hour, each subject is explored through the lives of Billy and Beth – normal in all respects except one: they just happen to be stick people. It is a great resource for both newbies to the Direct Sales area, and seasoned Direct Sellers. It would be a GREAT tool in helping develop the skills of your downline. What is website flipping you say? It is just like flipping a house - a person makes a website then sells it for a profit. There are those that do this as their main business and stream of income, and they do it very successfully. Amy, one of the instructors has been flipping and was able to quit her job and flip websites full time. There is an online website flipping coaching class starting next week at FlippingAwesome.com. The cost is $97 - if you are interested be sure to hurry because there are only 10 seats. The $97 is also a limited time discount. And you only pay if you are accepted into the class. "How do I choose a direct sales company?" No matter what type of company you are looking for, it is always important to do your research. In the video, Deb talks about some of the things you should look for, and some of the pitfalls you should steer clear of. Definitely worth a listen - have a great week!